Please Note: Local contractor licenses expire 9/30/2019. All insurance certificates or exemptions and corporation documents are required to be up to date and on file with St. Johns County to renew your license. Late fees apply if paid after this date. Online payments are currently unavailable. Contact St. Johns County Contractor Licensing with any questions: 904-827-6820 or conlicen@sjcfl.us. St. Johns County offers licensing from General and Electrical to painting and insulation contractors. We have been licensing those that are qualified to build whole buildings or entire operating systems, major components and non-structural, specialty and finish trades since 1976. The Contractor Licensing program ensures that only qualified contractors perform construction work in St. Johns County. All contractors, sub-contractors and sub-contractors of sub-contractors MUST be licensed with St. Johns County Contractor Licensing Division in order to work in this jurisdiction. Do your due diligence! Require to see a license card or don’t allow them on your jobsite! You could be charged with aiding and abetting unlicensed activity and face fines or revocation of permitting privileges. Don’t forget, you are required to display your contractor’s license number on all signage, proposals and contracts. State Statute 489 and St. Johns County Ordinance 2002-48 requires licensees to display their license number in any advertisement aired, circulated, displayed, distributed or marketed within the county that offers services of the contractor regulated by this Statute and Ordinance. Notice: All State Certified Contractors must register to operate in St. Johns County. Notice: Hiring an unlicensed contractor is a violation of Florida Statute 455.228 and is subject to a $5,000 fine. Florida Statute 489 and St. Johns County Ordinance 2002-48 require contractors to be licensed; before advertising, bidding or performing any work. Please report all unauthorized construction activity to Contractor Licensing at (904) 827-6820. All subcontractors working in St. Johns County are required to be licensed! Working around Lead Based paint? 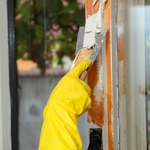 Contractors in Florida performing renovation, repair and painting projects that disturb lead-based paint in homes, child care facilities, and schools built before 1978 must be certified and must follow specific work practices to prevent lead contamination. EPA Lead Laws and Regulations. (2) "Mold" means an organism of the class fungi that causes disintegration of organic matter and produces spores, and includes any spores, hyphae, and mycotoxins produced by mold. (3) "Mold assessment" means a process performed by a mold assessor that includes the physical sampling and detailed evaluation of data obtained from a building history and inspection to formulate an initial hypothesis about the origin, identity, location, and extent of amplification of mold growth of greater than 10 square feet. (4) "Mold assessor" means any person who performs or directly supervises a mold assessment. (5) "Mold remediation" means the removal, cleaning, sanitizing, demolition, or other treatment, including preventative activities, of mold or mold-contaminated matter of greater than 10 square feet that was not purposely grown at that location; however, such removal, cleaning, sanitizing, demolition, or other treatment, including preventative activities, may not be work that requires a license under State Statute chapter 489 unless performed by a person who is licensed under that chapter or the work complies with that chapter. (6) "Mold remediator" means any person who performs mold remediation. A mold remediator may not perform any work that requires a license under chapter 489 unless the mold remediator is also licensed under that chapter or complies with that chapter.